Each drawer can hold up to 3 lbs. Carts have four casters (two locking). 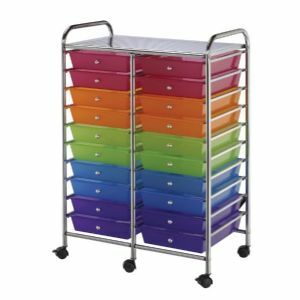 Double-wide carts (12-drawer and 20-drawer units) have middle leg supports and casters for added stability, with six casters (three locking). 133⁄8"l x 93⁄8"w x 2½"h.
Inside bottom dimensions of tapered deep drawer (3-drawer and 6-drawer units): 135⁄8"l x 9¾"w x 5"h.
128 points will be rewarded when you are logged in to your account and buy this item.